When Amazon announced last year that they were bringing out a tablet, I was very excited. I got my Kindle 2 years ago and I loved it so much that I really expected their tablet to be something special. So I was disappointed when initial reviews were lacklustre, to say the least. This year, they seemed to have got it right. The reviews I read were good, the demonstration models in Tesco and Waterstones were very impressive. And when Beloved Husband gave me a Kindle Fire HD for my birthday on Sunday I was beyond excited! Being Apple enthusiasts and using an iPad regularly, the Fire had quite a lot to live up to. After using it for a couple of days, I think it’s a real rival for at least the new iPad mini. The screen is beautiful with very sharp, clear text and graphics. You can scroll very quickly and there’s no lag on the graphics. Typing is good, and one thing I really like about the keyboard is that you can press and hold a key for special characters, just like iOS, but also the top row of keys gives you numbers without needing to switch to a number keyboard, very handy if you just need 1 or 2 numbers in a sentence. The web browser works quite nicely, though this is the one bit where I’ve noticed a few glitches and it had trouble loading a couple of pages. In general though very few problems, most pages load fine and pretty quickly. This blog post was typed entirely on the Kindle Fire HD, for example. App-wise, yes the Amazon App Store is much less content than iTunes. Not surprising, really, it’s several years younger! All the major apps are here – twitter, Facebook, Skype, Pinterest, WordPress etc. And, of course, Angry Birds! Mail gets my gmail quickly and unobtrusively pings to let me know, bringing with it my google calendar and contacts. I think given time there will be more than enough apps for everyone! Navigation is the most obvious difference to iOS. In the centre of the home screen is a carousel with large icons of everything on the device, the most recently used being first. Along the top of the screen is a category menu where you see all your apps/books/music etc by pressing on the category. Along the bottom are related items, depending on which icon is displayed in the centre of the Carousel. For example, if it’s an app, the bottom row will show other apps customers bought after buying the featured one. If the web is central, the bottom row shows trending web pages. If Mail is highlighted, the bottom row gives shortcuts to New Message, contacts and calendar. 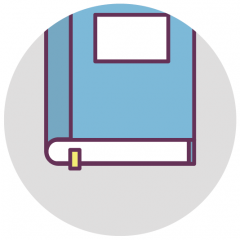 All of the category-view pages show either apps/books on the device or in the Amazon Cloud; when you register your device your books appear in the Cloud but it’s quick and easy to simply touch the book you want and it’s on the device in seconds. Similarly, buying an app is quick and easy. Too easy actually, it doesn’t by default ask for your password before purchasing so I’d recommend setting this up in Parental Controls! Again, quick and easy to do. Something that keeps catching me out is the lack of physical home button. I’m not saying this is good or bad, it just takes some getting used to! To get to the home screen you need to click on the home button on-screen; sometimes you need to touch or swipe the side of bottom of the screen to get this menu, depending on which app you’re in. This menu also gives you a back button and sometimes an in-app menu and search button. On every screen there’s also a star button which takes you to apps which you have designated as favourites, very handy. The build isn’t as posh as the iPad. Rather than the brushed metal, the Kindle Fire has the rubberised body of the Kindle. It doesn’t feel luxurious but it does feel solid and robust. I’m not going into tech specs, I wouldn’t know where to begin, but it has plenty of memory, works well and is a lovely experience. Better, I have to say, than I expected an Android tablet to be. How about reading? It is a Kindle after all. The most obvious differences are the weight and the lit screen. The device is still light and small enough to be held in one hand, although I think the Kindle ereaders would be more comfortable for extended periods of readjng. The screen doesn’t glare too much and the brightness can be easily adjusted which is useful. The one area I think Amazon have been a bit naughty in is the pricing structure. The HD is amazingly good value particularly given how good it is and I definitely recommend that people pay the extra £30 to get the HD rather than the Fire. BUT you then also get the option to pay £10 to remove sponsored adverts, and the only charger you get in the box is a USB to charge through your computer which takes about 10 hours longer than a regular plug. To get a plug you pay another £18 for the Fast Charge. So it’s not QUITE as cheap as it makes out but still, you do get a brilliant tablet at about a third of the cost of an iPad. I absolutely love my Kindle Fire HD and I can see myself getting loads of use out of it for a long time! I’ve listened to and loved Miss Saigon for about twenty years. I know every word and I identify with the characters – well, as much as I can without actually being an American GI or a Vietnamese prostitute forty years ago – so much that my pulse still races building up to the finale or when Kim and Chris sing out all their hopes and fears in The Last Night of the World. Despite that, it still took me until only a couple of years ago to realise something quite important. Kim isn’t a reliable narrator. Actually, she doesn’t do most of the narrating. If you ask me, The Engineer keeps the story moving along and to be honest he’s far more reliable. If you overlook the fact that he’s a self-serving, greasy pimp. He is pretty much upfront with his motives and he gives us an eye into what’s happening both in Kim’s story and in the wider setting. Plus he has his own humour and charm which make him a likeable and sympathetic character without the tormented heroism of Chris or the tragedy of Kim. Anyway, the narration. One of the most crucial parts of Kim’s story is what happens at the Fall of Saigon in 1975, and we get to see this in Act 2. The thing is, for years I listened to this and watched this as if it was a flashback. But it’s not – it’s a dream (and hey Sherlock, it’s there in the song title – Kim’s Nightmare. D’oh). That changes things – it’s not what actually happened, it’s what Kim remembers as happening. She was on the other side of the gates from Chris, and has had no contact with him for three years at this point; she has no way of knowing what he was thinking or doing and she fills in the gaps with her imagination in the guise of a nightmare. The reason this is important is that it provides her whole motivation for getting through what happens to her after the American evacuation. She hides herself and her son, murders her cousin and flees from Vietnam because she’s clinging onto a certainty that Chris loves her, promised himself to her and will return for her as soon as he can. Now if you take her point of view, which for years I did, this makes more sense; a Love-in-Adversity sort of theme. And you are full of sympathy for her and less so for Chris, who went off and married someone else, the cad. When the penny finally dropped with me and I realised how unreliable Kim is as a narrator – basically she is deluded for most of the story’s action – it changed my perspective on their characters. Kim is no less sympathetic but for different reasons, and I can no longer rely on her view of Chris. Instead of being a hero who changes into a cold-hearted scallywag who abandons Kim to her fate to go off and marry someone else, he’s a flawed man who had unexpectedly deep feelings for Kim but basically got on with his life. I’m not saying he wasn’t in love with her – he shows how much he was in love with her by the snatches that are revealed of him after he left Saigon, the way he had nightmares and what John says when he meets Kim (He [Chris] went crazy when he lost you, Spoke to no-one for a year) – but in the end He [Chris] finally said ‘I’m home now, My life has to go on here.’ For all we know, he regrets his impulsive offer to take her away to America and by the time the helicopters are leaving, maybe he’s ready to leave with them instead of the struggle that Kim imagines him having with John. And you couldn’t totally blame him. He’s obviously been messed up by the war, Why God Why reveals some of his struggles, but it does change how you view him. Re-listening to Miss Saigon with this in mind adds a sense of tragedy to earlier scenes that wasn’t there before. When Kim explains her reasons for surviving before you realise how deluded she is, you have hope for her happy ending. Listening to her again knowing the truth adds poignancy (not to mention a certain amount of wanting to shake some sense into her). It also changes how rational her final choices are. If she’d not held this idealistic view of Chris fighting all odds to come back for her and play happy families, she might have been able to accept the provision for her and Tam that Chris and Ellen were offering. Instead, I think she loses what little reason she had left and it has devastating consequences. All of these things are a great example of how the reliability of a story’s narrator can have huge impact, both on how the story goes and how it affects the reader/audience. Ok, I’m sorryabout the pun. But I couldn’t really pass up the opportunity. I decided to buy the DVD of Les Miserables: Live at O2 since I had some birthday money left, and it really is one of all my all-time favourite shows. And I have to say what I think – absolutely blown away. I’ve got the 10th anniversary concert, and I enjoyed that. The cast was great (I mean, Michael Ball, Ruthie Henshall, Lea Salonga, and of course Philip Quast against Colm Wilkinson) and you quickly got used to the concert format, where the actors stood at microphones rather than moving around the stage, and only the principals were costumed, with a huge choir in Les Mis t-shirts behind. I want one of those t-shirts. I’d be willing to swap husband for t-shirt if anyone’s interested; he’s pretty good, more or less housetrained and hardly ever eats the furniture. The new one, celebrating the 25th anniversary, was on another level. Repeating the concert format, but improving on it by having some props, costume changes and a little background action, it seemed to be fresher and livelier. I think this was helped by the new orchestration (aforementioned husband isn’t keen on that but I love it, brings it a little up to date without changing the power of the music). I also, though don’t quote me on this, think that both orchestra and choir are miles bigger than 15 years ago. Same conductor though, I noticed; I do like him. So, casting. As I said, 1995 was a pretty good cast. I am still unsure whether anyone can beat Philip Quast as Javert – the power and contained fury are fantastic – but Norm Lewis was excellent. As far as Jean Valjean goes, I’m a bit of a blasphemer; I like Colm Wilkinson, but he’s not my die-hard Valjean. Alfie Boe is a strong contender for that, as here he was mesmerising, excellent focus and a soaring tenor. And I thought his journey was utterly believable, right down to his little headshakes when the Bishop of Digne tells him to become “an honest man” or his falter when he reads Marius’ letter and realises that Cosette has been keeping her own secrets. The Thénardiers – now this was where I was expecting to grumble. Jenny Galloway is my all-time favourite Mme Thénardier, with brilliant timing, expressions in both face and voice and brutality towards little Cosette, so I was delighted to see her reprise the role. But when I heard that Matt Lucas was going to play her oh-so-charming husband, I was very disappointed, thinking the producers were going for a cheap celebrity shot and that he would just play it Little Britain style (and I’m really not a Little Britain fan I’m sorry to say). I warmed to him after watching a documentary about the production, but watching him actually do it has won me over as a new fan. He was Thénardier to the core – vile, slimy, in his own particular way, and bouncing off Madame perfectly. I would probably rate him now as my favourite in the role, and a real highlight of the show, just as Boubil & Schonberg envisaged all those years ago. For the women, again I was delighted. Samantha Barks was vulnerable yet feisty as Eponine, and I really wanted to see more of her, and Cosette managed to not be too twee. She had a pretty soprano voice that never shrieked, which I was pleased about. Lea Salonga, who is ALWAYS fantastic, pulled off a minor miracle. Fantine is, in my admittedly limited experience, always played too old, too frumpy, too whiny and her bits are the part where you don’t mind needing to go to the loo. But when Lea Salonga did it, she brought Fantine to life. You could see her being young yet prematurely aged; I believed that men would want to seduce her; I felt pain and longing and memories of a happy youth when she was singing. Major respect to Lea for playing Fantine as she exactly should be played. My one let down was Marius. Nick Jonas just didn’t seem big enough for the role. He looked far too young for a start, even next to Cosette, and his voice was terribly disappointing. It was very nasal, had no power and both his face and his voice seemed to convey a rather pained concentration without any joy of being in love, youthful idealism at the ABC Café or agony of losing his friends. I’m perfectly willing to believe that with lots more training and maturity he can grow into the role, but he was certainly the weakest link on that performance by far. On the other hand, Ramin Karimloo was a stunning Enjolras. He had the intensity needed, the voice to lead numbers like Red and Black or Do You Hear The People Sing? and was the kind of student every teenage girl dreams about. Actually, I have two let downs. The second is that I am so greedy, I want more. 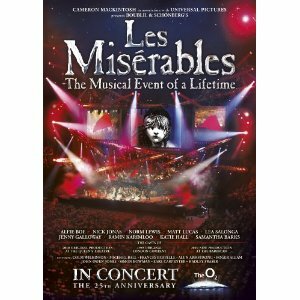 I know that what was on the DVD is not the entire performance of Les Misérables; what I don’t know is if that is because a redacted version was performed at the event at the O2 and we are actually seeing what the live audience saw, or if clever editing has cut out bits so that to see the whole thing you had to be there. Either way, I would have been over the moon to see the whole 3 hours of Les Mis as I know it on the DVD. It was magical from start to finish. And the buzz I got from seeing the special finale just on DVD was amazing, I can’t imagine the adrenalin of actually being there! Here’s the link to Amazon if you’ve enjoyed my review; highly, utterly recommended. As an aside, I’m thinking about doing a regular blog post about musicals. Not always, or even often, a straight review like this, but my tuppence’orth on different aspects of my favourite shows. Whaddya reckon? Comments appreciated, as always.